Rev your engines as Lightning McQueen and Mater are back on the track and racing through theatres in CARS 2! My kids have been waiting to see this movie for months now and they finally got their chance this afternoon. My husband, the kids and I spent the afternoon at the movies for FREE! I've been planning and saving for this special CARS 2 movie date for months now. In fact, I've been saving a $50 Fandango Gift Card since January and a $25 Regal Cinemas Gift Card since February. I knew I could use one for movie tickets and the other for snacks. I earned both gift cards online which made them perfect for a frugal movie night for my entire family! 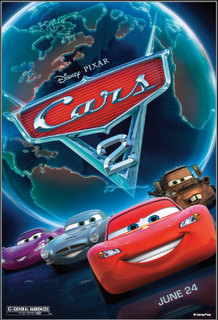 CARS 2 was fantastic! My husband and I enjoyed it just as much as our children (girl 7 and boy 10) did. The movie reminded me a little bit of James Bond. It was full of action and suspense. Spies, secret agents and lots of laughs. The scenery and bright, bold colors were simply stunning. I enjoyed my trip around the world. 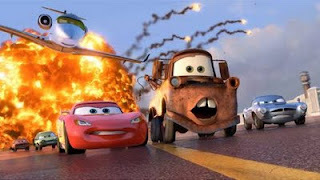 While CARS 2 was full of excitement the bottom line was all about the value of friendship and staying true to yourself. That's one lesson that every child (and adult) should teach, learn and remember. We give CARS 2 two thumbs UP! It's a great movie that the entire family will love!